You know how to get physically fit - but what about mentally? If you’re interested in working on your physical health, there’s an easy way to do it. The doctor might tell you you’re out of shape, and you need to focus on your diet and exercise. You cut back on sugar, introduce some leafy greens, and hit the gym everyday after work. You’re getting physically fit. But what happens when your mind isn’t in sync with your body? When you want to improve your mental health, the path isn’t so clear. Unless you visit a mental health professional, your primary care physician probably won’t ask how you’re feeling – at least emotionally. You don’t do “brain lunges” to develop mental muscle, and while certain foods might be good for boosting brain power, you won’t be able to see the fruits of your labor with six pack abs or buns of steel. So, how do we know if we have good mental health? Why don’t we talk about mental health in the same way we discuss physical fitness? We have doctors for both types of “health.” It’s reported that 1 in 6 Americans take a psychiatric drug. So why aren’t yearly “mental health” checkups a thing? Why don’t we talk about the exercise we’ve been doing on our minds? Why isn’t psychiatry – or self help – more important? Although I spend a lot of time indulging in self-help literature and topics, it is often just that: an indulgence. What I know intellectually is often not used practically, as is the case for many of us. 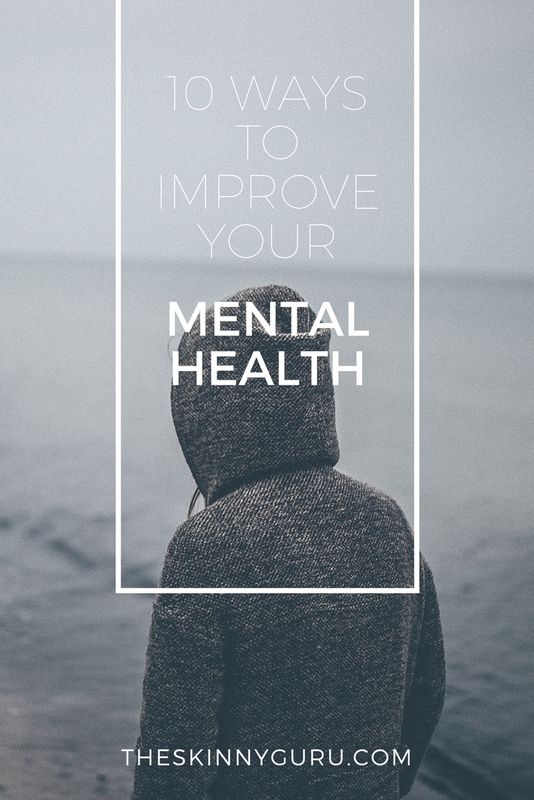 You need to work to improve your mental health – not just read through a list of strategies. Start with these and see what resonates with you! Elle Woods’ statement in Legally Blonde was SO RIGHT. Exercise makes you happy – or something like that! The number one way I keep my mental health in check is by working out. It’s a brain chemical thing, but it’s also a confidence thing. What I eat has a HUGE impact on my mental heath. When I’ve had a lot of sugar, I go into meltdown mode. I get super emotional, I cry, I lash out. You might not even realize how it’s affecting you until you get rid of it (it will help trim your waistline, too!). Alcohol has a lot of sugar in it, so you bet this one is on the list. Ever feel super down after a long weekend of partying? Yup. This is a hard one for me – I’m not the best communicator! We all have different ways of handling our business, but if something’s bothering you, HANDLE IT. Don’t keep things bottled up – say what you need to, when you need to. And do it calmly, if you can. Some of the top performers in the world use meditation on a daily basis to control their mind and to keep their body in tip-top shape. While you don’t need to sit in silence for 20 minutes to reap the benefits, taking a few minutes everyday to catch your breath and slow down is a great way to regulate your mood. I get super bitchy when I don’t get enough sleep. Anybody else? My brain doesn’t function properly and I could cry at the drop of a hat. Don’t do this! Aim to get AT LEAST 7 hours of sleep per night. I know everyone says that, but seriously. I’m typically in bed around 10 or 11, and wake up at 7 or 8. Speaking of picking up the phone – now get rid of it! Have you seen Ingrid Goes West? It’s a movie about the detrimental mental health effects social media has on us. It’s a satire – and totally ridiculous – but really highlights the insane way we remain glued to our phones. Can’t be good. Vitamins could be your B and C and the multi-V you take everyday – or it could mean whipping up a veggie-heavy smoothie every morning. If you’re not getting the nutrients you need, your body and your brain are missing out. Doing something as simple as drinking a green juice each day could make a huge difference. Try these things and let me know if they improve your mental health! Former Reporter @ CBS. Mental health advocate. Writing about love, loss, and making sense of it all. Trying to be better than I was yesterday.